Whip up one or more of these festive Valentines Day Card Ideas for Kids! 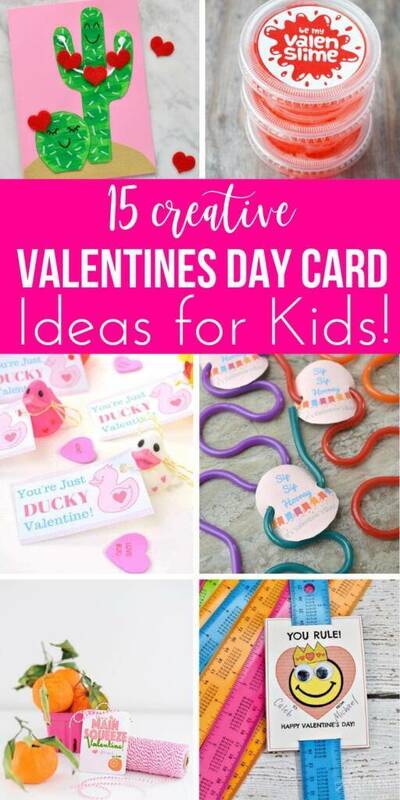 Whether you are looking for Valentine’s Day cards for kids to take to daycare, school, or family and friends, you will find some awesome ideas below. Finding cute Kids Valentines Cards Ideas each year can be tough. And buying cards from the store each year can be expensive! Here are some cute Valentines Day Card Ideas for Kids that you can make at home! Grab some single serve Kool-Aids and print out the free printable for a really creative Valentine’s Day Card for your kid to give to friends and family. These little mazes are so fun and you can find them at most Dollar Tree spots around Valentines. This is a free printable card that you attach the little mazes too. Easy, quick to make and loads of fun. Who doesn’t love a rubber ducky when you a little kid? Here is a free printable that you can attach to a toy duck and have your kids pass them out to kids. Is this not such a fun idea? Now she shared two options using a real orange and then the other is using a bottle of orange juice. Here you have a non-candy Valentine’s Day gift that is loads of fun. Print out the free printable and use this to give a silly and fun gift to your child’s classmates. If you want a simple but fun card, this Owl Valentine’s Day is a wonderful one that you can print at home, cut and hand out. I love the bold colors. How cute are these homemade caterpillar leaves. This is a fun leaf with a candy stretched out and transformed into a caterpillar. Kids love the fun look of these. These slapping hands is a creative Valentine’s idea to your friends, classmates or gift to neighbors or other kids your kids know. Isn’t this card adorable? With a little construction paper, your child can make fun hot air balloon cards just like this. It looks extravagant but the instructions are simple to follow. Whether you make your own slime or buy it, put in small containers and print off the free printable. Such a simple but popular Valentine’s Day idea for kids. Make homemade cards that pop up and add an element of surprise. These are so fun to make and only a few supplies needed for these creative cards. How adorable are these bee inspired Valentine’s day cards? They use popsicle sticks which is so unique! I love the idea of letting your little ones help make it. If you have a kid who loves LEGOs this might be the perfect Valentine’s day card idea. Creative, fun, and unique from all the rest. Let your child sit down and make a cactus card or two. These are absolutely adorable and would make the perfect card to give to a teacher, neighbor or loved one. No better way to say you rule than by a handy dandy ruler valentine! Pick up bulk rulers online or buy them in a dollar store for a great price. Then print out the printable and you have a fun card to hand out. What is your favorite Valentine’s Day card idea for kids?